There are acres of atmosphere in this narrative, off-set exquisitely by the relative poverty of the Peninsula Region. These sounds, and all the accompanying noises of the countryside and power station, similarly consume DC, who is creating what he calls World Music, capturing then editing the call of starlings, the laboured breathing of a diver, the relentless hum of the power station itself to create something new you’ll find yourself resonating with, even without hearing first hand. Slewing between omniscient meanderings that feel like they may be those of the power station itself, and conversations that slip in and out of paragraphs without anchoring speech marks, the overall impression is of tides and fields where a path can sink into mud or disappear into mist without pardon. As we emerge from the bleak winter months, horned poppies bloom and the skylark “begins to give voice.” As Edwards focuses on these details, the wilderness of the area gains a vivid presence that completes his portrait of this deeply recognisable if fictional place. While DC and Tarquin each aspire to their own form of greatness, each makes errors of judgement with unfortunate and, in some cases, tragic consequences. Regardless, the natural heartbeat of living things continues to permeate the landscape, blending with the hum of the power station. Beautiful, bleak and humorous, Country Life is a book you’ll relish visiting, even as you emerge feeling relieved not to live there yourself. 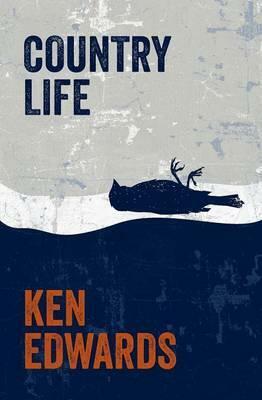 Country Life by Ken Edwards is published by Unthank Books. This entry was posted in Reviews and tagged Book reviews, Country Life, Ken Edwards, Unthank Booka by Judy. Bookmark the permalink.